As we prepared to leave for the birthing center, I remembered that I didn’t have any belly shots from the last several weeks. Now I was afraid that if I didn’t have one taken right away it might not happen at all, so I asked Tim to retrieve the camera from the truck to take one. 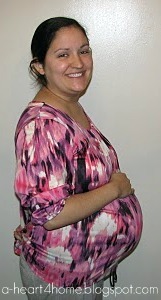 Here’s my 38 week very pregnant self, already in labor. After Tim took the photo he left to pick up my sister. (Don’t worry, at the time she lived about a 1/4 mile from our house. )By this time my contractions were about 5 minutes apart and lasting a little over a minute each. I was still able to work through the contractions on my own so I thought I was probably only about 4 or 5 cm dilated, but after Jonathan’s super quick labor I didn’t want to risk not making it to the birthing center on time.When they returned I ran through a few quick things with my sister, then the three of us prayed together and Tim and I headed to the birthing center about 35 minutes away. Thankfully traffic, even around a decently sized city, is pretty much non existent at 4:40 in the morning so we were able to get to the birthing center without delay by about 5 AM. When the midwife on call, Addie, checked me upon arrival I was already at 7 cm. She and the nurse, Rachel, couldn’t believe I was so far along since I was laughing and acting “too calm” to be that progressed in labor. Find out what happened next with Part 3. You can also read the rest of our birth stories. It’s amazing how they are all so different!